'Barnacle monster' draws beach crowds Jump to media player A piece of driftwood encrusted with gooseneck barnacles draws crowds to Burry Port, Carmarthenshire. On the rocks with Spain's barnacle hunters Jump to media player Goose-neck barnacles have become a valuable commodity in northern Spain as the country's economic struggles continue. 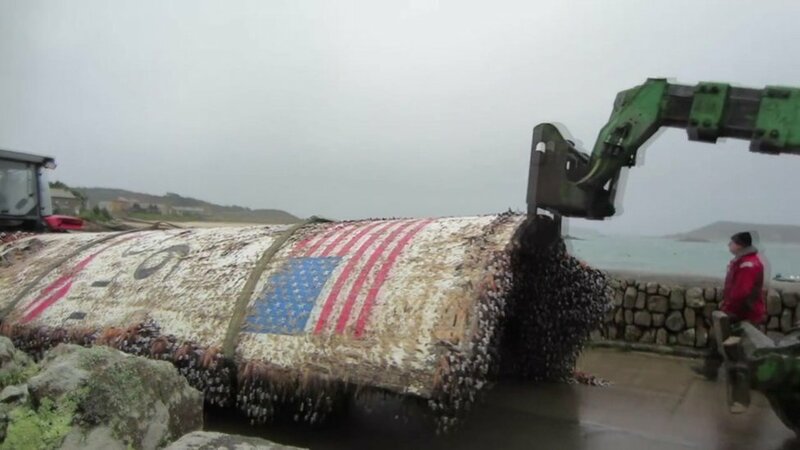 Rocket debris removed from beach Jump to media player A large chunk of an American space rocket has been removed from a beach on the island of Tresco on Scilly. Some have likened it to a sea monster with tentacles, while others have dubbed it the beast of Burry Port - but what has washed up on a Carmarthenshire beach? It is in fact a large piece of driftwood encrusted with gooseneck barnacles - which are a delicacy in Spain, according to council ranger Emyr Richards. The spectacle has attracted crowds of people over the past couple of days. However, as the barnacles survive in water, they are now beginning to die.